According to Fayette County Commissioner Jim Garland and Dayton, Power and Light (DP&L), 33 poles fell in the county on Saturday night following the heavy wind, ice and snow that fell. DP&L reported that within 24 hours, the roughly 4,000 customers without power were restored, leaving only two mid-Monday afternoon still without power in the county. Power has been restored to around 4,000 residents in Fayette County only 24 hours after 33 electric poles fell in the county on Saturday night during the latest winter weather event, according to Dayton, Power and Light (DP&L). That being the case, Cabel said — as mother nature has a way of doing — the lines in various places were impacted. Overall, she said 31,000 customers were impacted, but not all at one time. The bulk came on Saturday, but according to Cabel, some additional power outages were reported on Sunday. Fayette County Sheriff Vernon Stanforth said Monday the ice has caused multiple vehicle “slide-offs,” not only over the weekend, but also on Monday. Currently no injuries have been reported from these accidents, but Stanforth warned the community to continue to drive slow and safe on the roads, as ice and snow are just the beginning of the worries with temperatures dipping as low as 2 degrees Monday. As of mid-Monday afternoon, the DP&L power outage map showed just two people in Fayette County still braving the cold weather without power. Stay with the Record-Herald for more updates on potential winter weather in Fayette County. 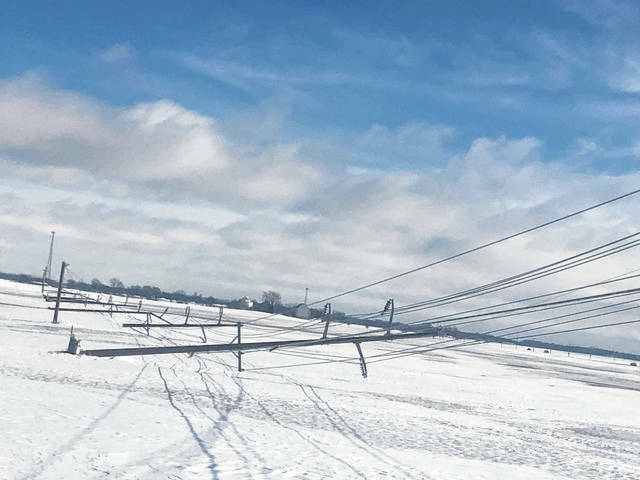 https://www.recordherald.com/wp-content/uploads/sites/27/2019/01/web1_LotsOfPoles.jpgAccording to Fayette County Commissioner Jim Garland and Dayton, Power and Light (DP&L), 33 poles fell in the county on Saturday night following the heavy wind, ice and snow that fell. DP&L reported that within 24 hours, the roughly 4,000 customers without power were restored, leaving only two mid-Monday afternoon still without power in the county.